Sound barriers are custom acoustic insulation that blocks sounds instead of absorbing or damping them. They’re made of dense materials and are used at the source of a sound and along its path. To choose the right noise control product, engineers need to understand how sound barriers work, how they’re made, and the different types that are available. Sound barriers block or prevent sound waves from passing-through ceilings, walls, floors, and other structures. They’re usually made of vinyl, a dense but flexible plastic that also offers strength, durability, and resistance to moisture and humidity. Some sound barriers are made of mass loaded vinyl (MLV), a sheet material that contains salt, sand, or tiny metal particles for added mass with minimal thickness. 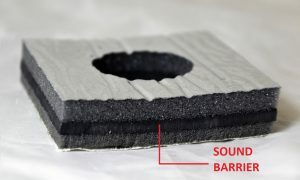 Sound blockers can be used with foams and facings that provide sound absorption, vibration control, and other specific properties. Melamine, a type of acoustical foam, is used commonly because it’s semi-rigid but flexible. Melamine foams are also lightweight and flame-resistant. Facing materials can provide frequency attenuation, chemical or abrasion resistance, decoration, or support for cleaning. Sound blocking materials are supplied as sheets or rolls in various lengths, widths, and thicknesses. Using water jet cutting, a fabricator can cut materials to size without paying for or waiting for tooling. 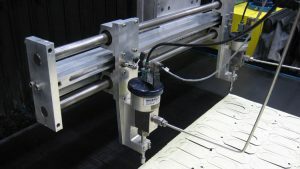 Water jet cutting is also faster and more accurate than manual cutting. First, however, the fabricator can laminate different acoustical materials together to create an insulation “sandwich”. 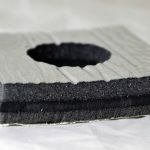 To provide a complete acoustical solution, sound barriers are bonded to foams and facings in a sandwich-like structure. 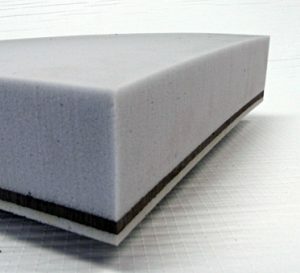 This custom acoustic insulation is then applied to metal, plastic, wood, and other surfaces in buildings, equipment, vehicles, and machinery. 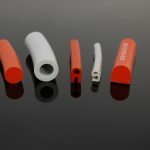 For peel-and-stick installation, a pressure-sensitive adhesive with a removable liner or backing can be used. Many types of sound barriers are available, but not all of these acoustical materials are right for your application. For example, a sound barrier that’s suitable for a factory office may not be able to withstand the splash of automotive fluids in an engine compartment, or the petroleum products used with industrial machinery. Sound barriers also have different sound transmission class (STC) ratings. Sound blockers for buildings are installed between walls or underneath flooring or carpeting. Often, the barrier material is sandwiched between a decoupler and a layer of acoustic foam. Decoupling, the mechanical separation of two sides of a structure, causes the sound barrier and the acoustic foam to vibration independently from each other. In other words, the decoupler isolates the sound. Depending on the types of materials used, sound barriers can meet Class A requirements for building and construction or UL 94 standards for flame resistance. In HVAC systems, flexible vinyl sheets that are bonded to aluminized reinforced plastic film can be used as pipe wrap or duct wrap. Sound barriers are also used in machine housings, engine compartments, and equipment enclosures. Sound barriers are installed in mobile equipment and military vehicles, too. Custom acoustic insulation for buses and railcars needs to meet specific flame, smoke and toxicity (FST) standards. Sound blockers in military land systems also promote occupant safety. When custom acoustic insulation is used as vehicle flooring, a non-slip surface and wear resistance are required. The article you’ve been reading is the third in a series about how to stop noise with custom acoustic insulation. The last article in this series will examine sound dampers. If you’d like more information, please contact Elasto Proxy. 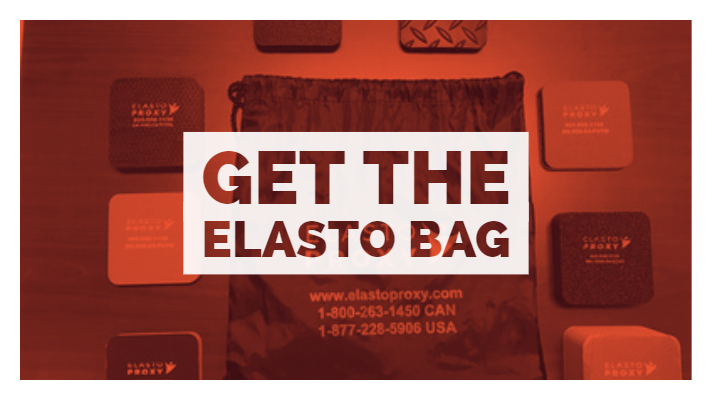 You can also ask for the Elasto Bag to see some sample insulation for yourself.